Over on RowingMusings (read that blog! 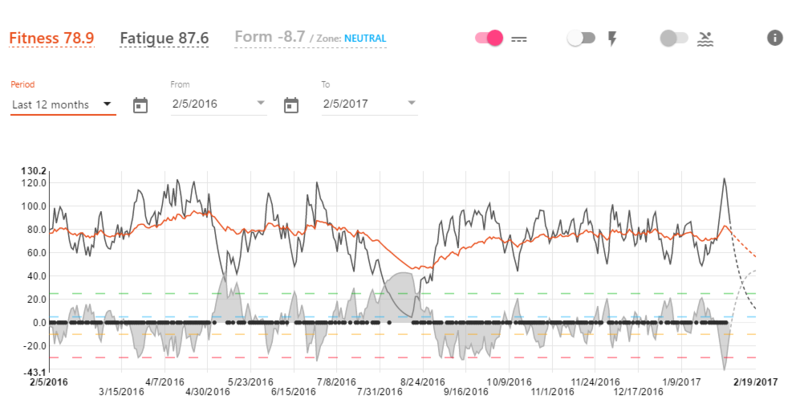 ), a recent post discussed Stravistix, a Chrome plugin to add some stats to Strava. 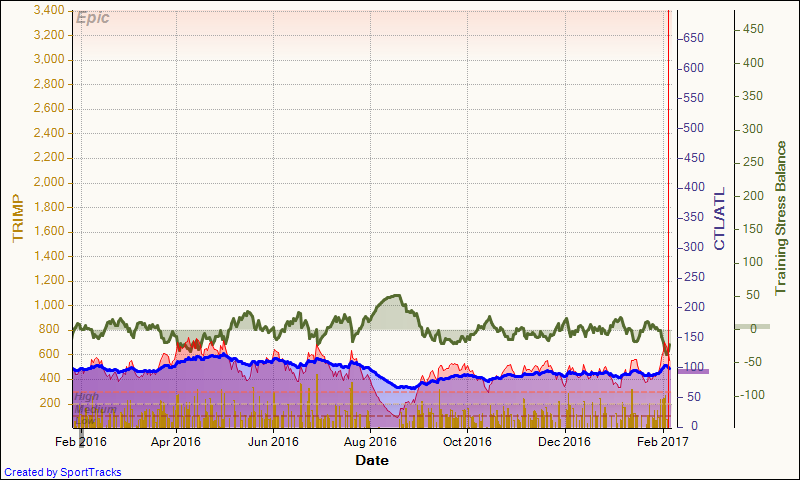 The most interesting add-on is a Fitness & Fatigue graph, based on the TRIMP measure of your training load. SportTracks and TrainingPeaks also have something similar implemented. The PC version of SportTracks has a plugin that does the same. When you are a Masters rower who trains regularly, it is very helpful to monitor graphs of Fitness, Fatigue, and Training Load. The principle of these metrics is quite straightforward. For each session calculate a “Training Impact” Number. This “suffer score” (or Training Stress Score) is one number that indicates how hard the training was. There are various ways to calculate such a number. It is basically a weighted average of training intensity over the time. Various proxies are available for training intensity: Power, Speed, Heart Rate. Calculate the Training Stress Balance (TSB) which is the difference between CTL and ATL. As your CTL represents your Fitness and your ATL represents your Fatigue (the opposite of Freshness), the TSB represents “Form” (Fitness+Freshness). I think this is a great way to help you monitor overtraining and detect stagnating fitness. But you have to know how to interpret the graphs. I use the standard out-of-the-box values for all parameters used in the calculations. So do these graphs tell the same story? All of them show roughly the past 12 months of training. Somewhere in March 2016, I switched from erg based training to boat training. I tried to peak for races in mid July and early August. Then I took a vacation with low training intensity, which was great for mental recovery from the racing season. In September, I resumed training for a head race in October, and then on to the winter erg training from November onward. Looking at “Form”, SportTracks (PC) puts my best form (highest TSB) in the middle of my vacation. Sporttracks.mobi (the Performance graph on the right) shows three peaks, and then seems to suggest that I greatly reduced training intensity (and thus form) after the vacation. Strava has a Form peak in May and a peak in the middle of my vacation. Regarding fitness, the PC version of SportTracks and of Strava come much closer to my gut feeling, but SportTracks.mobi seems to be more in line with my erg scores. The main difference seems to be that the SportTracks.mobi has a much shorter time period to measure CTL. On this site, you get fit faster, but when you reduce the training load, your fitness drops almost immediately. This seems to give a better representation of what happened during my vacation. The book Training and Racing with a Power Meter gives some good advice about using the Fitness graphs. One of the observations in the book is that athletes show their best performance when TSB turns positive, but not overly, especially for shorter duration events with a larger anaerobic contribution (think 1km sprint racing for Masters rowers). So while a positive TSB value is an indication of good form, a higher positive value does not necessarily mean better form. All this is quite interesting stuff to think about when you plan your taper for an important race. In my experience, how I feel is more related to relative changes in the graphs than in the absolute values. For example, today, after one day of full rest after a very intensive week of cross-country skiing, I still feel highly fatigued. My fatigue scores are roughly equal to the values that I had during the entire period of April to July, but I am sure I am more fatigued now and I badly need a “light” week. Looking at the graphs, I see a very steep growth of both CTL and ATL as a result of last week. I expect to fully recover in a few days of rest and light exercise. This doesn’t mean my TSB value will be positive, but it is going in the right direction.